At Elite Motor Sports, we are committed to providing the greater Woodland area with the highest quality car supplies, including suspension systems, tires, wheels, lift kits, and more. Customer satisfaction is of the utmost importance to us, and it is our goal to provide you with the absolute best customer service. For the best in high quality automotive supplies in the greater Woodland area, visit Elite Motorsports today! No one ever plans on encountering any sort of car trouble and almost always, these things usually come as a surprise to us. Keeping up with your car’s maintenance is a great way to ensure that your car trouble will be reduced to a minimum, but even so, there’s only so much that you can do. Take tire troubles, for example. In our previous blogs, we’ve talked about some ways that you can avoid getting flat tires, but there are many factors that we cannot control that could result in getting a flat. One way that you can be more aware of your car’s overall health is to be conscious of your tire pressure. There are a wide variety of ways for you to do this, and in part one of this blog series, we will discuss them in addition to giving you simple examples on how to check your tire pressure. There’s a lot to cover, so let’s dive right in! There are many essentials that one should have in their car at all times, from a first aid kit to a phone charger to an ice scraper for those of who may live in or travel to colder regions. In addition to these, having a tire pressure gauge in your car is an absolute essential, as it will allow you to get an accurate reading on your tires’ current pressure. These can be easily acquired at a wide variety of places, from auto supply stores to the automotive section of most major discount retail stores. Tire pressure gauges come in a few varieties from more simple models to more complex ones. The simplest ones look not unlike a ballpoint pen and can be acquired for just a few dollars, while more expensive models include digital screens that give you a more exact reading. Either of these will be adequate, though some models provide more accurate readings than others and are easier to use. Checking your tire pressure on a regular basis will give you an idea of whether your tires need to be filled or not, and this is a far better option than checking it only when your TPMS light turns on. We will discuss how to check your tire pressure in just a moment. 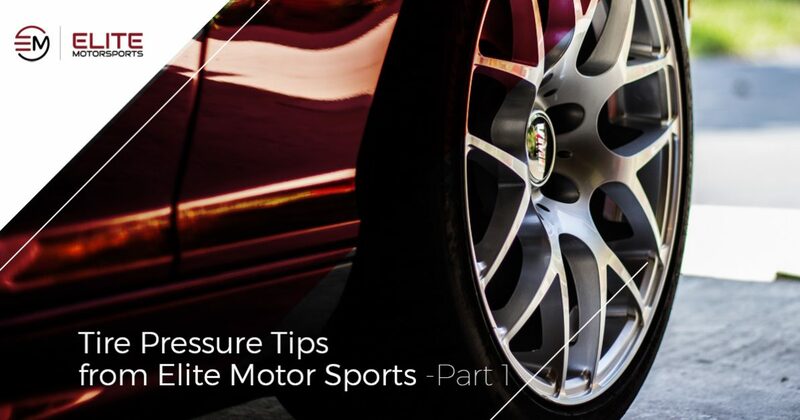 That is just one tip to ensure that you have consistent and solid tire pressure. We will continue this in part two of our blog series, but until then, for all of your Woodland tire needs, Elite Motor Sports provides the greater Woodland area with a variety of tires, wheels and other automotive products and services. To learn more about Elite Motor Sports, contact us today!